President Trump stepped up his long-running battle with Amazon, ordering a federal task force to investigate the Postal Service’s finances. Trump has frequently complained that Amazon (AMZN) takes advantage of the post office. Trump is angry at Amazon in part because its CEO, Jeff Bezos, is also the owner of The Washington Post, whose coverage Trump complaints about. The Postal Service is a government agency, but it operates as an independent business without direct taxpayer support. The order points out that the post office has lost $ 65 billion over the last 11 fiscal years. “It shall be the policy of my administration that the United States postal system operate under a sustainable business model to provide necessary mail services to citizens and businesses, and to compete fairly in commercial markets,” Trump wrote in the order. In his previous tweets, Trump has insisted that the Postal Service is losing money on the package deliveries it handles for Amazon. Amazon has a confidential agreement with the Postal Service under which it delivers large numbers of packages directly to the post office nearest to where they need to be delivered. The Postal Service then delivers the packages to their destinations. The Postal Service says the law requires that such negotiated contracts must cover the Postal Service’s costs and that regulators have studied the Amazon contract and approved it. 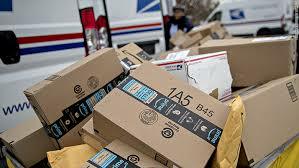 Amazon also has a special agreement with the Postal Service to deliver packages on Sundays in limited major markets. Neither Amazon nor the post office has disclosed the details of that agreement, but the Postal Service says it’s mutually beneficial. Some critics, including post office competitors such as UPS (UPS), have challenged the claims that the Postal Service’s negotiated deals with bulk shippers truly cover its costs, especially considering that the post office loses so much money. Citigroup last year found that Postal Service prices would have to go up by $ 1.41 per package — about 40% — to reflect the true cost of delivery for all its customers. The Citigroup analysts estimate that would add $ 2.6 billion to Amazon’s shipping costs, an increase of 28%. Amazon has disputed those estimates. The executive order noted that the post office’s problems are caused by many factors: steep declines in first class mail, laws that require the service to deal with large inflexible costs, and revenue that no longer covers pension and retiree health obligations. “The USPS is on an unsustainable financial path and must be restructured to prevent a taxpayer-funded bailout,” Trump said in the order. The Postal Service issued a statement Friday welcoming the task force. “As we have repeatedly stressed, these business model problems are serious, but solvable, and the President’s executive order … provides an opportunity to further consider these important public policy issues,” the statement said. Although the revenue from both first class letters and other types of mail, such as magazines, has steadily declined, online shopping has driven package delivery demand higher. The post office’s most recent fiscal report shows package and parcel delivery was up $ 1.6 billion, or 19%, last year, at a time when revenue from all other types of mail fell by $ 2.5 billion, or 4%. A major part of the Postal Service’s financial problems is a government mandate that it pay up front for retiree pension and health care expenses. Those obligations for current and past employees stood at $ 38 billion at the end of its most recent fiscal year. Private businesses that have retiree benefit obligations are not required to pay those amounts up front. Get inside information from the president and you will probably lose half of your money. If you get it from the chairman of the board, you will lose all of it.